Promoter Don King says Bermane Stiverne could fight Britain's Tyson Fury if the Canadian beats Deontay Wilder. On Saturday, WBC title-holder Stiverne, 36, will fight 29-year-old Wilder, who is aiming to become the first American heavyweight world champion since 2006. "If Bermane wins I'll see you in the UK with Tyson Fury," King told BBC Radio 5 live. "That's a great possibility. Tyson Fury has done a great job. It's something that everybody would want to see." 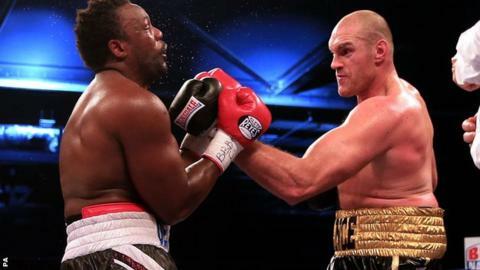 Current British and Commonwealth champion Fury, the mandatory challenger for Wladimir Klitschko's WBO world title, fights on 28 February against Germany's Christian Hammer in London. Wilder has won all 32 fights inside the distance, including a first-round victory against England's Audley Harrison in April 2013. Haitian-born Stiverne has won 24 of 26 bouts and Saturday's fight in Las Vegas sees the first defence of his title, which he won with a sixth-round stoppage of American Chris Arreola in May.